...As Speaker of the House, Hastert supported the George W. Bush administration's foreign and domestic policies. After Democrats took control of the House in 2007 following the 2006 election, Hastert chose not to seek the position of minority leader, resigned his House seat, and became a lobbyist at the firm of Dickstein Shapiro. In May 2015, Hastert was indicted on federal charges of structuring bank withdrawals to evade bank reporting requirements and making false statements to federal investigators. 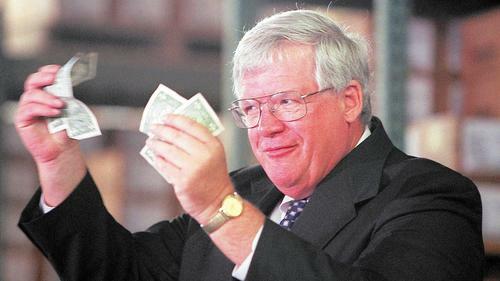 Federal prosecutors said that the money was to compensate for and conceal deliberately unspecified misconduct by Hastert against an unnamed individual years earlier. In October 2015, Hastert entered into a plea agreement with prosecutors. Under the agreement, Hastert pleaded guilty to the "structuring" charge (a felony), and the making false statements charge was dropped.